The Integrated Monitoring programme monitors the effects of transboundary air pollutants on ecosystems at various sites throughout Europe. Comprehensive measurements are used to draw up water and material cycle balances on catchment scale. These detailed observations of cause-effect relationships are incorporated into the development and validation of simulation models. The models are used to simulate the effects of future developments (clean air policy measures, changes in the deposition of air pollutants, climatic changes) and to estimate the effects of air pollutants on ecosystem substance cycles in other locations. The German Environment Agency operates two Integrated Monitoring stations in Germany. The Integrated Monitoring Programme (IM) is one of six International Cooperative Programmes (ICPs) under the Geneva Convention on Long-Range Transboundary Air Pollution (CLRTAP) in which Germany has two monitoring stations. The objective is to make comprehensive observations of the effects on ecosystems of air pollution which does not originate from local sources but rather from the long-range, transboundary transport of air pollutants. The international ICP Integrated Monitoring Programme Centre is located in Helsinki; UBA acts as Germany’s National Focal Point for the programme. Annual reports and scientific papers of the ICP IM Programme are forwarded to the CLRTAP Working Group on Effects (WGE). The main scientific purpose of the ICP IM is to frame water cycles and mass balances and analyses at catchment level. Inputs of air pollutants are measured or modelled in closed catchment areas. Substance output is also measured by a technical gauge system to take stock of substance pathways in the system but mainly within the forest stand and the soil. The matter export measured at the drainage ditch integrates anthropogenic impacts and their effects on the bio-chemical cycles on spatial and temporal scale. Material balances at catchment level help to reach conclusions about key biological and geochemical processes, thus enabling an assessment of the past and present condition of complex ecosystems across a larger area. The measured water and nitrogen flux data is used in model simulations to describe different scenarios (changes in deposition of air pollutants, climatic changes). 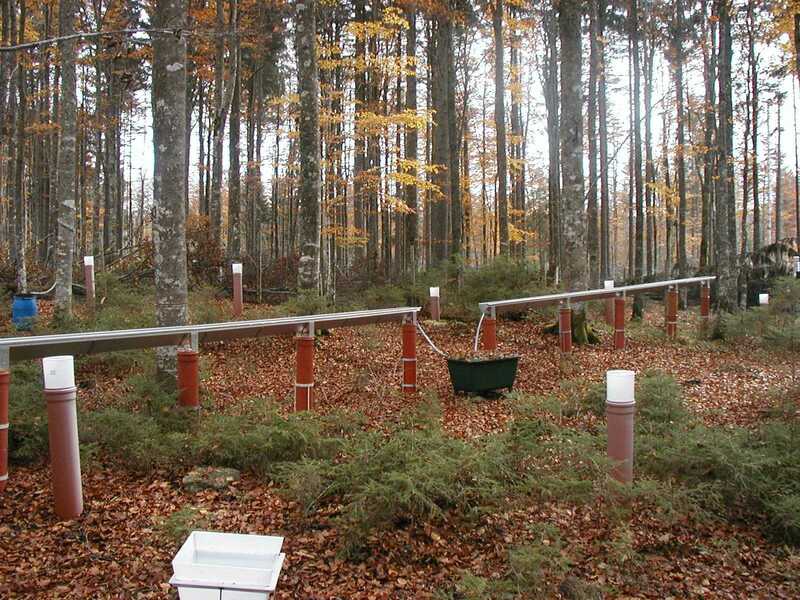 UBA’s Integrated Monitoring station in the Forellenbach area of the Bavarian Forest (DE01) and the lowlands monitoring station at Neuglobsow-Stechlinsee (DE02) offer ideal conditions for observing the effects of air pollutants on forest ecosystems. The station at Forellenbach is the programme’s most significant station in central Europe and disposes of data over long measurement periods and operates a comprehensive monitoring programme. The station is representative of background concentrations in the low-range mountain area (800-1,300m above sea level). The Neuglobsow-Stechlinsee station is located in a large nature conservation area in Germany’s northern lowlands. UBA continued the operation of the former GDR station in 1998. The Forellenbach IM station is located in the Bavarian Forest National Park. UBA took over its operation in 1990. The Free State of Bavaria is a station partner, represented by the Bavarian Forest National Park Administration (NPV) and the Bavarian State Institute of Forestry (LWF). Per administrative agreement the NPV is in charge of observation and the LWF carries out chemical analysis. Observations cover the subprograms meteorology, air chemistry, precipitation chemistry in open field areas and und forest canopy, stemflow, groundwater chemistry, surface water chemistry, foliar chemistry, litterfall chemistry, microbiology, forest growth and crown condition, fish, vegetation, vegetation structure, lichens, bird inventory and phenology. 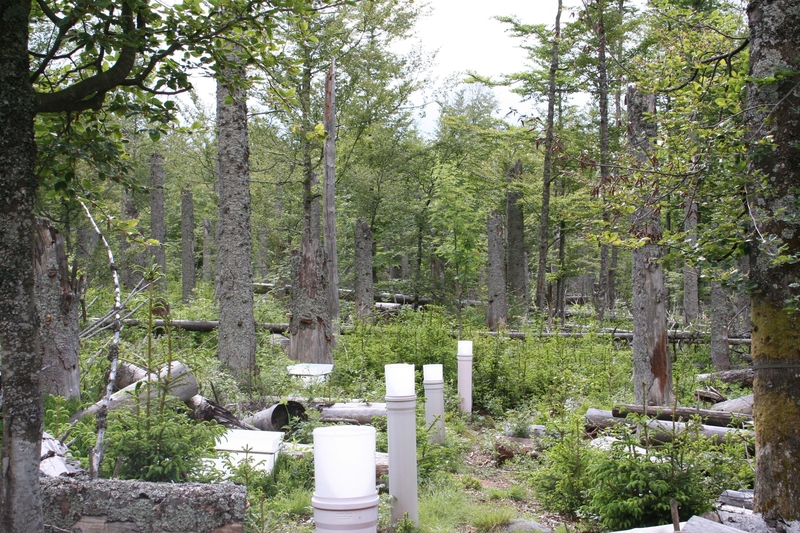 Among the commonly known air pollutants, inorganic nitrogen from combustion processes and agricultural production is currently the most significant because a surplus leads to severe system changes, especially in plant communities with a limited nitrogen supply such as acidophilous forests. The task of the ICP IM is to report on the development of nitrogen flows and nitrogen storage in the catchment areas of the IM network and to compare the critical loads and exceedences in ICP Modelling and Mapping with the results from the tested sites. Despite successful emissions reductions the measured nitrogen load in the Forellenbach area is still well above the critical load level which is tolerable in the long term. Observations will help to improve simulation models. Observations have also helped to draw up maps of critical loads and nitrogen depositions, thus enabling exemplary validation. A simulation model was adapted to the natural conditions of the Forellenbach region for the purposes of this very specific task. Since experience under the Integrated Monitoring Programme has up to now only modelled acid loads, the project to model nitrogen has pilot character for the entire monitoring program. 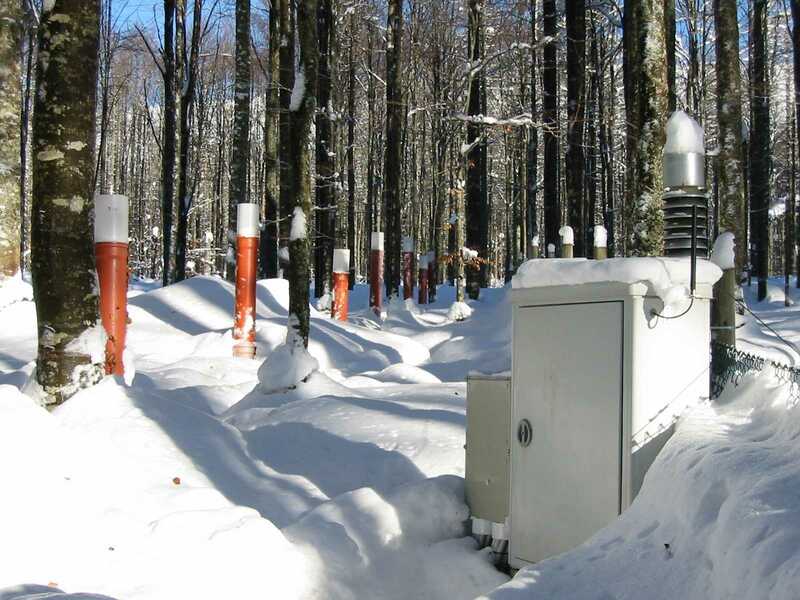 With the aim of developing future scenario simulations (deposition, climate change) the model system is meant to accurately reproduce the water and nitrogen balances measured at the station in interaction with climate and changes in the forest cover. It must be taken into account that the forest in the area of investigation has been decimated to 40% of the original area since 1994 due to bark beetle infestation. The biochemical processes triggered by the die-off therefore interfere with pollution-driven developments and other changes caused by climate change. Changes do however occur in the water balance, which temporarily counteract the changes brought on by current climate change. These interactions and the effects of climate change which the scenarios reflect about the local water regime by the end of the 21st century are at the focus of current monitoring activities. 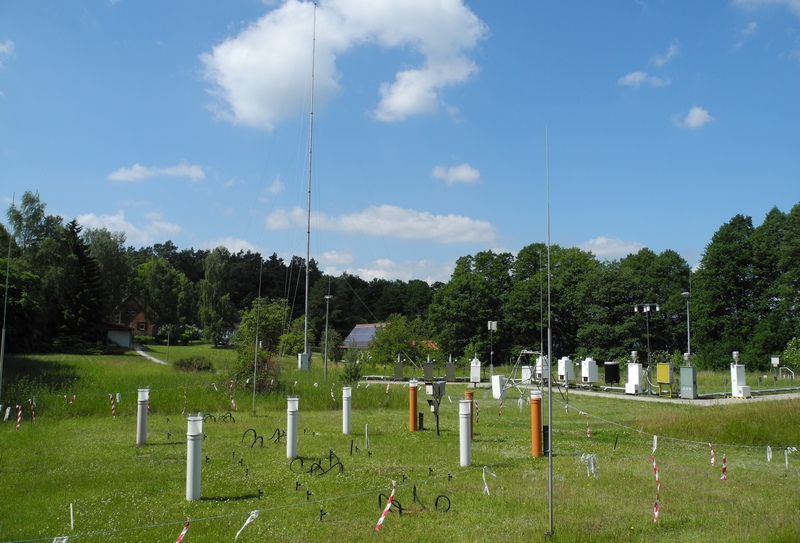 UBA’s Neuglobsow-Stechlinsee lowland monitoring station has collected data on precipitation, groundwater, surface water, climate and weather since 1998. Ecosystem-based test programmes have been built up since 2004. 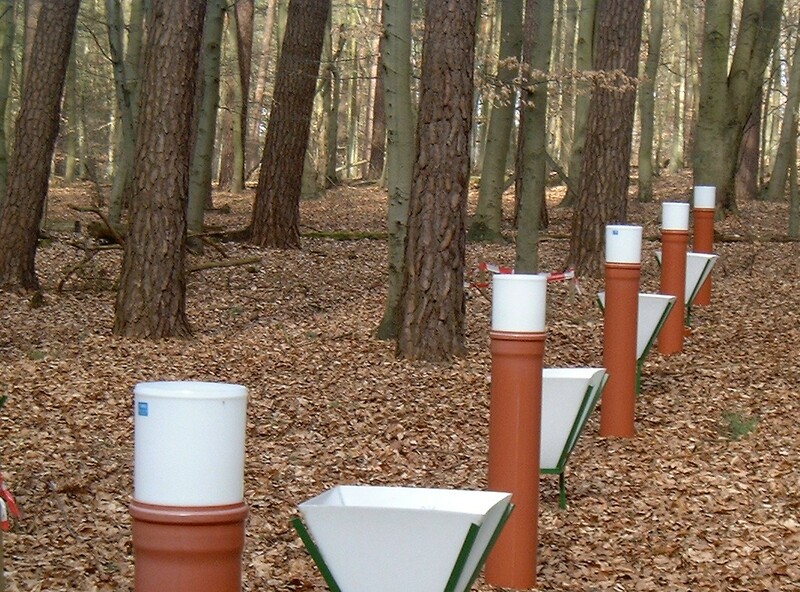 In the framework of an analysis task commissioned to the University of Göttingen the litterfall, stemflow, tree growth, vegetation, microbial decay activity, foliar analysis, and tree bioelements are currently investigated. The station also collaborates with the Leibniz-Institute of Freshwater Ecology and Inland Fisheries. Research has revealed both very low atmospheric substance input and minimal loss through leachate, as traced in particular through the elements sulphur, calcium and nitrogen. Average nitrogen loads in open field precipitation between 1997 and 2007 were 6.5 kg ha-1 a-1 and therefore under the levels measured at Level II stations in northern Brandenburg. Annual mean nitrogen loads are at a level which is below the amount of nitrogen determined by biomass growth. This indicates that some parts of the forest stock are living on their reserves. Most of the sulphur inputs, which have declined for many years, remain in the soil-plant system. Based on investigations carried out to date, the uniqueness of the location must be emphasised. This is due to the special conditions in the catchment area which has an oligotrophic (nutrient-poor) freshwater lake at its centre. Its existence depends on constant low amounts of nutrient input. Based on the projected changes in precipitation as a result of climate change and the concomitant loss of ground water recharge and quality, this could have a negative impact on the hydrodynamics of the lake and its chemical and biological processes in future. Furthermore, the mixed pine and beech woods in the monitored area are exemplary of forests in the moraine areas of northern Germany. 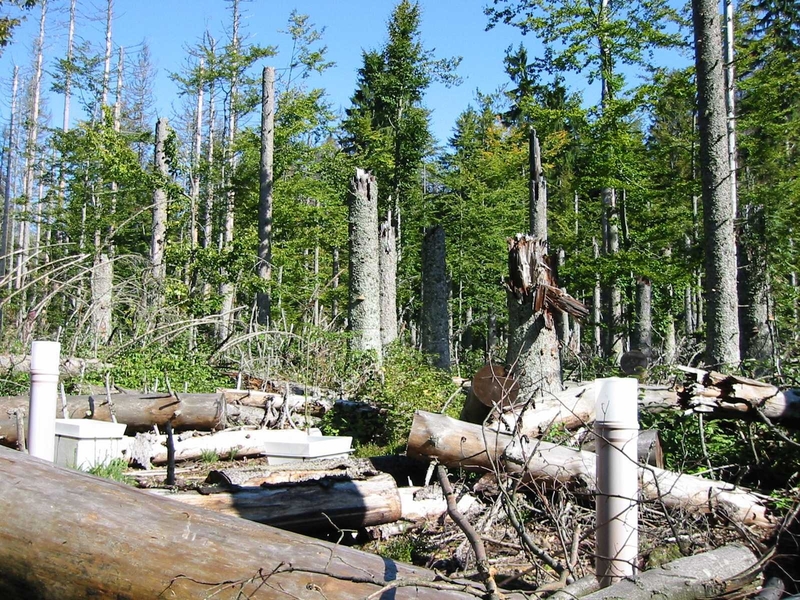 The data gained from monitoring provides an indication of the expected forest development in comparable locations with changed precipitation patterns caused by climate change.